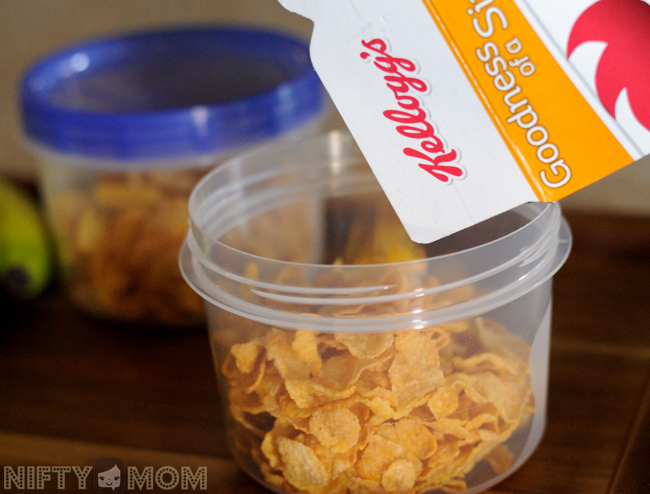 This #GreatStarts tips post is sponsored by Kellogg’s. All opinions are my own. Some mornings, mainly on the weekends, I simply need a little more sleep. In an effort to sleep in occasionally, I put together breakfast the night before. 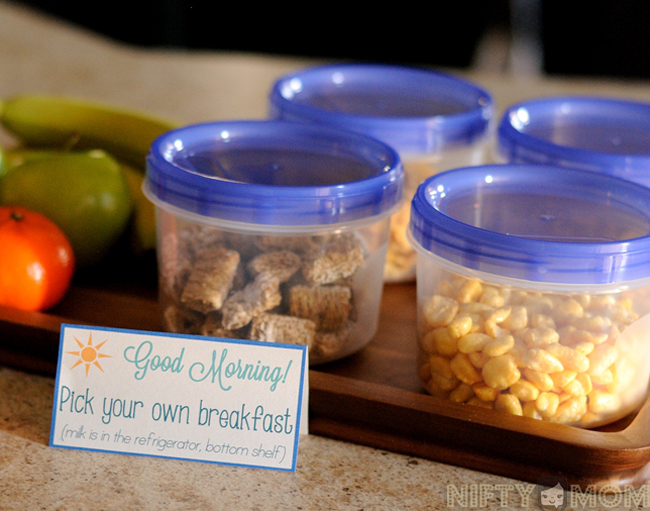 Leaving portioned foods out for the kids to prepare is an easy, quick start breakfast that encourages independence. Not too long ago, my husband and I would get up pretty early on the weekends to make a huge breakfast. When the boys would get up, they would help mix the eggs and other ingredients, depending on what we were making. They loved getting involved and it was a great time for the whole family. However, there were those weekends when we wanted to sleep in a little. Was it really necessary for us to always get up way before the kids to enjoy a good breakfast? Would the kids be upset without it? What can we do to get an little extra sleep on the weekends? I begin to think of ways to prepare breakfast the night before. Something that would be ready to make in the morning or ready to eat when we wake up. Then I thought, why not have something the kids can prepare. Being just two, three, and four years old, there aren’t too many options. But I knew if I can make it work, they would love it. They want to do everything themselves these days, so this would make them feel extremely independent. Cereal is a popular breakfast in our house. We typically have no less than 6 boxes in our pantry at all times. The boys love having an option and picking out their own. Why not prepare it so they can make it themselves? 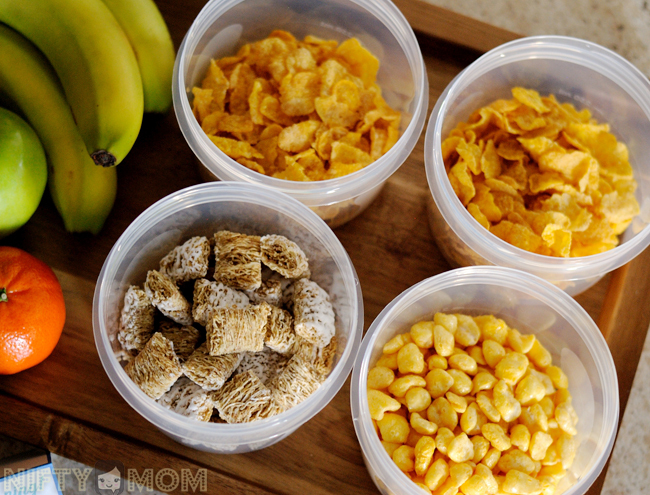 The night before, I portion out a variety of cereals in seal-able containers. With the cereal, I add some fruit and place it on a tray on the end of the kitchen island. This way it is easier for the boys to reach. Next, I portioned out milk for the cereal in three seal-able cups and placed them with their filled drinking cups on the bottom shelf in the refrigerator. Now on the weekend, we can sleep in until the boys wake up, and have their breakfast ready to go. The big time bonus: they get the independence they strive by having a selection to pick from and making it themselves. Of course, we will be right there if they need assistance, but they do whatever it takes to do it all themselves. That is definitely a great start to a great day. 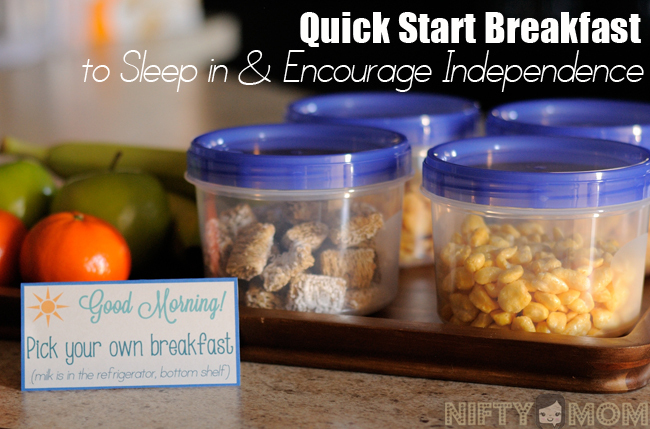 For more daily tips visit Kelloggs.com/GreatStartsTips and check back here through the next month for more of my tips. This is such a good idea! There might be a few messes here and there, but it might be worth a little more sleep for me if the kids can do breakfast by themselves. We do this with our kids and it is seriously a life saver! I get to have that extra hour of sleep and I feel so much better and ready for face the next week. Great idea! My kids were very proud of themselves when they started making their own breakfast. The first thing they made was eggs in the microwave. We all love cereal in our house also but I never thought to portion it out the night before when the kids were young. So smart! Wow what a smart idea. I can usually sweet talk my oldest into going back to sleep but my youngest is always SOOOOO hungry at 6:30 am. I love your little note, that is so cute! This is such a great idea too! My son is 8, so he’d be able to do it on his own. What a cute idea and I know this would have been popular with my kids when they were at home.